Last weekend I winterized the beehive. When I took the top off to look inside, I noticed that they had built some free-form comb between two frames where I had left some space. It was full of honey. I put the top back on, but I got to thinking about that honey. Would it cause any harm to pry out some of that comb? I went back out with my hive tool, and after a little jiggling around, I had honeycomb in my hand. The bees were nestled deep in the hive and it was too cold for them to want to come out. What to do with the comb? How to get the honey out? My beekeeping operation is minimal. I don’t have fancy equipment or a honey house. I did some internet research, and learned that there is an extraction method called “crush and strain”. So I smashed the honeycomb on a plate with the back of a wooden spoon, then scraped the gooey mass into the screen of a sprouter lid that I had placed on top of a wide mouth jar. It works–light amber honey drips into the jar. After more reading, I learned that honey should be harvested when the weather is warm because it’s more liquid then. November honey is thick and slow. I learned that the free-form comb is called burr comb, and bees build it where they have space. 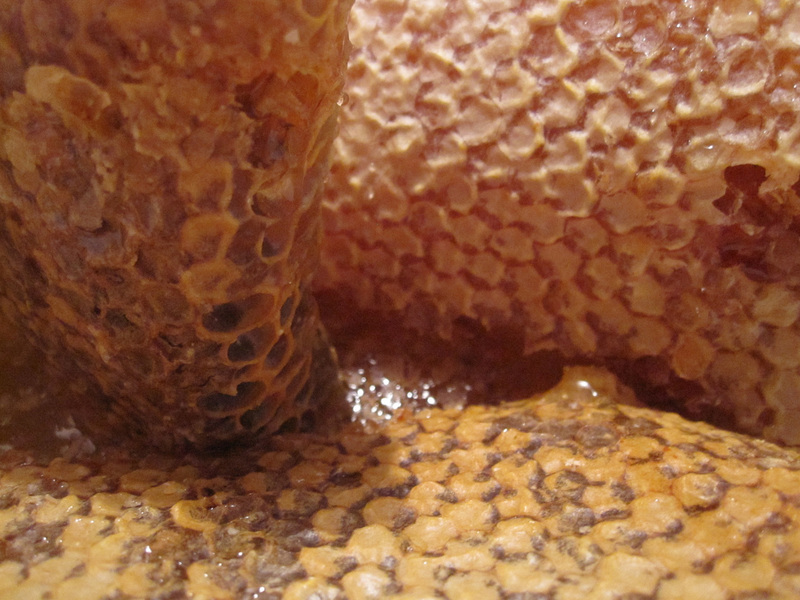 Beekeepers inspect their hives frequently, and scrape the burr comb off. It’s very orderly and geometric inside a beehive. Giving bees rectangular frames to draw comb on and store honey makes harvest easier. Also inspection–the beekeeper can lift the frames out to look for brood, which are the developing larvae of new bees. I learned that I need to keep a better eye on things inside my hive–proper frame spacing, removal of burr comb, scraping of propolis (the glue that bees make to plug holes and stick things together). The bees seem healthy, but I watch for mites and individuals that appear sick. They can get infections of the gut and trachea, and that can wipe out the whole colony. Seems that I learn best by doing. I have a couple of beekeeping books, and have studied them. But curiosity about a particular situation and actual experience ensures that what I learn goes into long-term memory. Next spring I will have to invest in some more bee gear, like a hat and veil, gloves, and a straining bucket. More learning ahead! My fingers are crossed that the bees get through winter in great shape. In the meantime, I’ve got a bowl full of sticky burr comb that I squish and let drip in small batches. Then I get to learn how to melt the wax and figure out how to turn it into something useful. Because of the learning and joy beekeeping has brought to me, I’m going to take advantage of an opportunity to share. By making a donation to Heifer International, I can help a family somewhere in the world obtain bees, supplies and training so that they can raise and sell bee products. There are many domestic animals to choose from which help people be more self-sufficient but since I can’t donate for everything, I choose bees. This is not an advertisement–the catalog showed up in my mailbox, and when I saw the bees I thought of a world-wide community of beekeepers. Pretty darn cool to be able to pass on the learning and sweetness.